Your Texas Estate Plan: Lawyer Referral Services, good or bad? I practice in a small firm. I like that, and I choose to be here. I have had chances to go to "biglaw," (the commonly used term for big-city, big-dollar and big-number of attorney lawfirms) but I chose then and will continue to stay in "smalllaw" because I have not found a good enough reason($) to deal with all that comes with the aforementioned "biglaw." However, there are trade-offs for everything. Here in smalllaw land, new clients are generated by word of mouth, family, and friends. And google. And lawyers.com. And a host of companies who, for the low fee of $500/month, promise to get YOUR name out there. All well and good. Upon review of one nationally prominent unnamed legal referral service, I saw that my firm was paying an average of $400/month for one specific listing on a website. It generated, on average, 2 calls to the firm per month over the past 18 months. These calls led to the grand total 0 clients. Not a tough decision here to cut that expense. I've long wanted to start my own lawyer referral website, thinking I could just sit back and watch the advertising dollars add up. Turns out this requires a lot of work, so it is not in place yet. Until then, I am always looking for ways to generate new clients, without paying $400/month. Oh great, another one. But I read on. This service is sponsored by the State Bar of Texas. Interesting: the club I joined, that should be advocating for me, that I pay to belong to. The article talks about how they can refer new clients, build your practice, etc. All good. Then the part hits me: $125/ year in fees, and if you get a case that generates more than $500, 10% goes back to the lawyer referral service. I'm sorry, what? 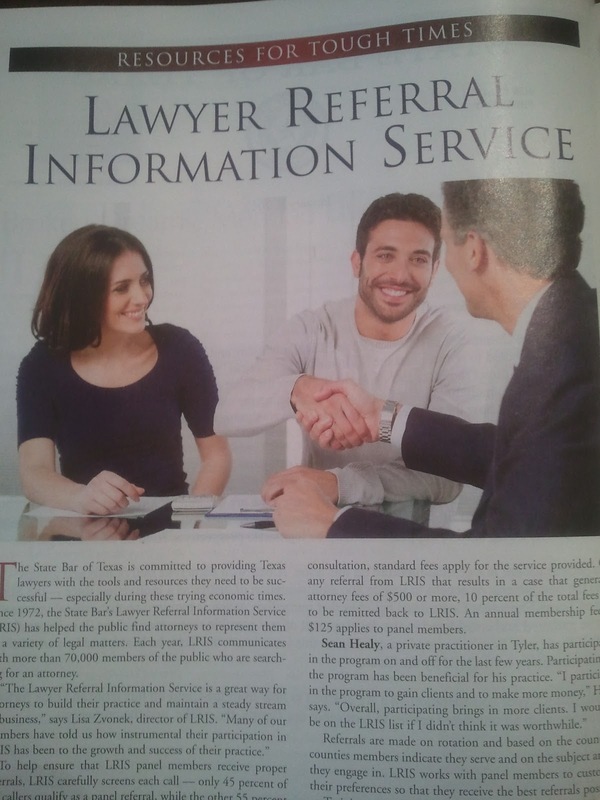 A referral fee that goes back to not just the "referral service," but the State Bar of Texas? Is that legal? So I did some checking. Chapter 952. Full text available here. Makes the above sound fishy, right? Referral fees are, subject to a few requirements, very legal and ok. They allow a lawyer who is over their head to get some help, share the love, and still get paid. All good things. However, I was always under the impression referral fees to a non-attorney were very not ok. Is that not what is going on here? And by the STATE BAR of TEXAS, who enforces and makes those same rules? I also checked the Occupational Code, Chapter 952. See it here. Guess what it says? (a) The state bar shall adopt reasonable rules subject to the approval of the supreme court to administer this chapter. I don't see that anywhere on this ad. If I hit a million dollar case, is $100k reasonable? Guess who decides? The state bar. This all seems fine, but they way I read B and D, is that fees that fund this program are the $20 pops. That's it. No mention of a percent recovery and the purpose of those funds anywhere. The more I look, the more of these type outfits there are out there. There are many, nationwide. Most that I have seen thus far have the deal where you pay to join, you pay $20 for the consult, and that's it. No kickback referral fee. However, some others require a percentage fee. Wisconsin has one. The City of Houston has one too, but they claim to be a non-profit. They take 15%. The ABA has actually issued rules on referral services, which can be found here. Maybe Texas decided it was ok. However, I cannot find a rule that says it is, and Sec. 952.155 of the Occupational code seems to say otherwise, even though the Bar regulates both. Maybe the 10% percent fee goes to legal aid, or some other good cause. But I cannot find a place that says where the money goes. The ABA also has a list of lawyer referral services in Texas, or LRIS services, here. Some have the ABA seal of approval. The Texas State Bar LRIS program does not. I wonder why? I am sure (really, I just hope) that there is a great, clear, explanation for this that I have totally missed. I am sure (really, I just hope) that there is some fine print I missed. I am sure (really, I just hope) that my State Bar, the group I swore allegiance to, is not trying to squeeze more money out of me and my fellow attorneys in what are tough economic times by deceptive means. This thing has been around since 1972. I can't be the first person to ask these questions.